Saturday was an odd day. I arrived with hopes of finding more dragonflies (which I did) and with a lingering hope of again encountering the huge blue racers that I had seen the week before. But instead I had a couple of interesting encounters with other critters. Despite a rather cool week, the woods are finally leafing out and the grass on the savanna is now long and green. The irises near the old farmstead have begun to bloom. The wet weather has really encouraged the wild strawberries, which seem to go on forever. Even the prickly pear cactus has started to perk up, and new growth is emerging from the withered, brownish segments that endured the winter. There are a few walnut trees at the top of a sandy hill. Grass grows in their shadows. 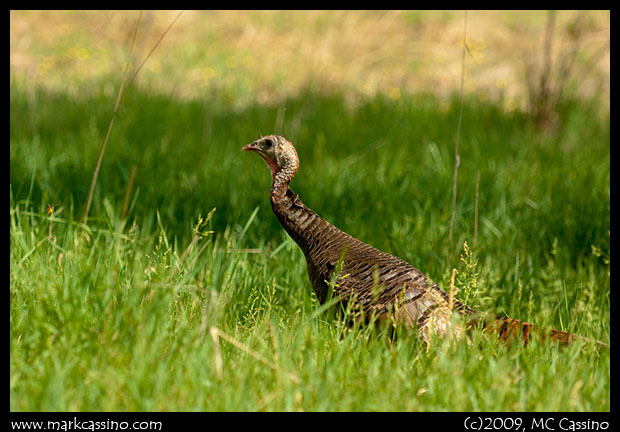 As I neared the top of the hill I was startled when a while turkey burst out of the grass from beneath the nearest tree. It literally ran circles around me, weaving and dodging but mostly just circling counterclockwise. After several circumnavigations the bird ran straight to the wood line, and took up position just inside of the brush. I expected it would disappear – wild turkeys are exceptionally good at that, but instead it paralleled my movements and tracked me for several yards, clucking a squawking the whole time. 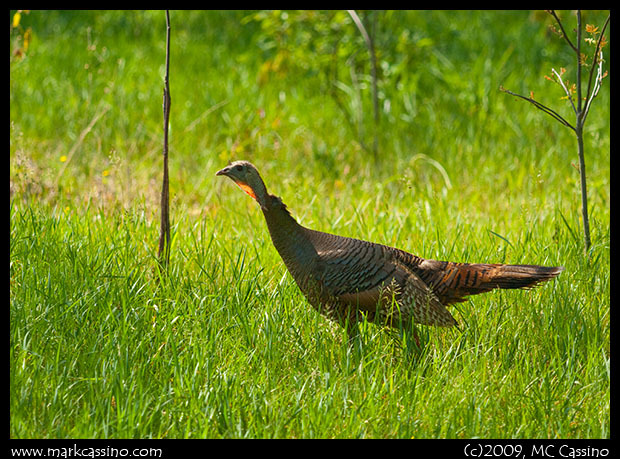 When I had advanced about 30 yards the bird suddenly broke out of the woods and charged past me, running like made through the field and making it to the pine forest on the other side. I’m not sure what was on the bird’s mind. I’ve seen similar behavior from turkeys with chicks, but in those cases the mother bird leads an orderly retreat of the young birds away from danger. In this case, I saw no sign of young birds or a nest, but then I only took a cursory look by the walnut tree- if eggs or chicks were there I really didn’t want to disturb them. I made my way down to the pond. As I neared the water’s edge, I spotted a young raccoon wading in the shallows – probably looking for some tasty frogs for brunch. 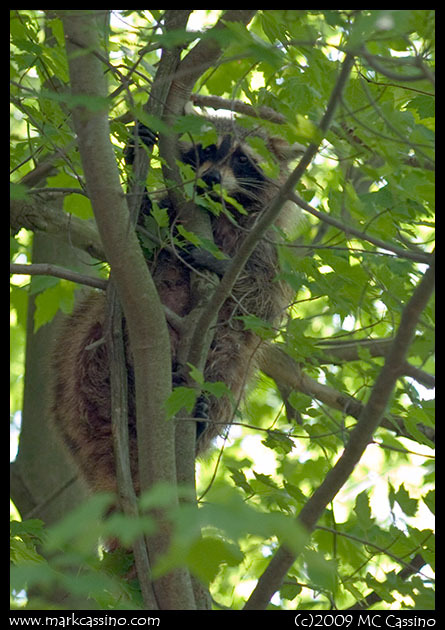 The raccoon spotted me almost instantly, and ambled up a small tree where it paused and glared at me. Raccoons are normally nocturnal animals, and there’s a risk that individuals who are out in the day light might be rabid or otherwise ill. Even though this individual was out and about in the late morning sun, it seemed perfectly well. When I returned to the spot after a short wander along the water’s edge, it was gone. As I said, the pond continues to grow. The small pines and brush that are inundated are finally dead or dying. 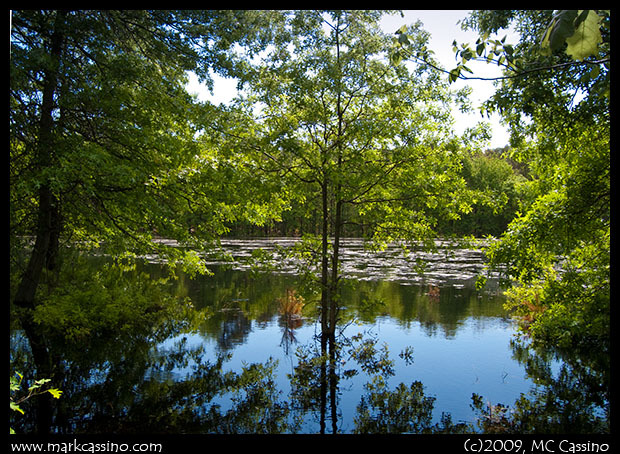 I don’t know what standing in a few feet of water will do to the mature trees – but the summer should reveal that. I see no sign of fish in the pond, which may be why the mosquito population near the water is staggering. There were lots of dot tailed whitefaces along the water’s edge, along with hundreds of damselflies. I’ll leave off here with yet another Dot Tailed Whiteface. 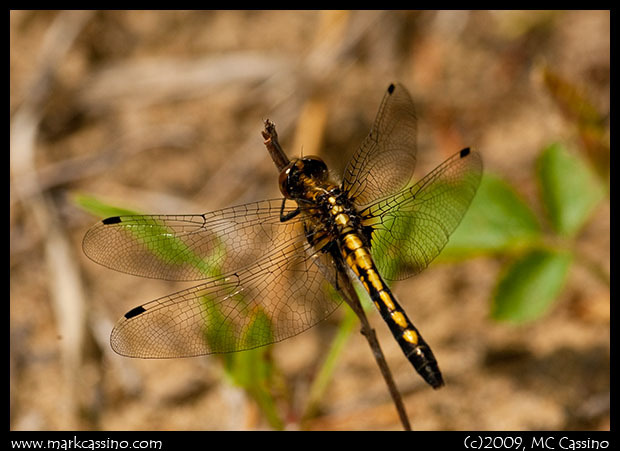 Later in the day I encountered several other species of dragonflies, and those will be the subject of the next post.